Loss of oil pressure due to worn components in critical oil circuits and/or lube related failure. For AODE, fits '96-later only. Sonnax Sure Cure Kit SC-AODE-4R75E targets the root cause of multiple concerns by sealing critical circuit pressure losses in the valve body. The kit contains uniquely designed parts to prevent the loss of pressures within the main line, converter clutch, overdrive and solenoid circuits. Many of the valve components for the valve body are oversized to address significant wear from many miles, which requires appropriate tool kits for installation. The kit also contains updated transmission components to address forward and direct clutch failure, OD band failure, intermediate roller clutch/mechanical diode failure and other chronic issues. The Sure Cure Kit quick guide provides clear and easy instructions to get the unit sealed up and back on the road quickly. 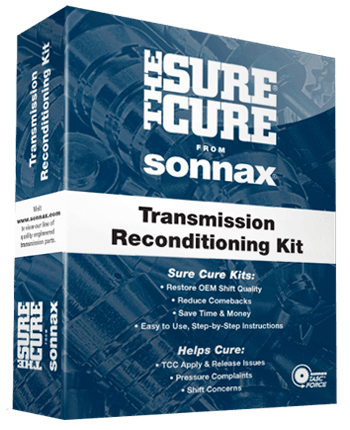 Knowing exactly what parts to replace in troublesome transmissions is an ever-increasing challenge, but Sonnax Sure Cure kits solve this problem for you. Each kit is a comprehensive reconditioning package featuring the best Sonnax products developed to help rebuilders restore and enhance transmission performance. Works in roller clutch or mechanical diode applications.